World peace lovers have not yet forgotten the deaths of three teen-agers in firing by security forces in Anantnag on June 29 which took the toll to six in three days and 11 in less than three weeks during the upsurge in protests against the ongoing killing of Kashmiris when new wave of terror and harassment has been unleashed by India upon the young and old leading people determined to achieve freedom. Occupied Kashmir has been wracked by streets protests since June 11when a 17-year-old student lost life after being hit by a tear-gas shell. Such protests, in fact, have become part of the people’s struggle for right to self-determination backed by the United Nations Organization. Jammu and Kashmir as a state, size-wise, is larger than 96 independent states of the world. The tragedy is that two-thirds of its area has been occupied by India whereas it is a disputed territory within the meaning of international law. As matter of fact, its future status was yet to be determined when Indian forces invaded the territory on October 27, 1947, and obtained temporary accession of the state from its autocratic ruler while, at the same time, promising the Kashmiris as well as the UNO that the future status of the territory would be determined by its people. The commitments in this regard, incorporated subsequently into the UNO resolutions of August 13, 1948 and January 5, 1949, stipulate that the status of the state shall be decided through a free and fair plebiscite under the auspices of the world body. Six-two years have passed but India hasn’t fulfilled the promise. That’s why the demand is gaining momentum that the international community, in general, and the UNO, in particular, should use all their moral, economic and diplomatic pressures to stop forthwith the massacre of innocent Kashmiri people; ensure withdrawal of more than 0.7 million Indian occupation forces from the territory; induct the UNO Plebiscite Administrator; and secure the earliest exercise of the right to self-determination by the people of Jammu and Kashmir Kashmir. Worth-recalling is a relevant incident. A 22-year-old Japanese student tried to commit suicide in the strife-torn occupied valley because it did not match with what he had seen in travel brochures. “This is not the Kashmir I’ve known and read about. I was hurt,” were the words of the youth who said he was depressed by the ominous presence of gun-totting Indian army personnel and the absence of happy people. Koichiro Takata, an ophthalmology student, went crazy as he walked for nine kilometres from Srinagar city airport, and was anxious thinking about all the police guards around him. He stabbed himself several times with a pair of scissors. “I was afraid and went crazy after seeing so many gun-totting men in the city. I thought my safety is in question and the gunmen will kill me instantaneously,” Takata told newsmen. 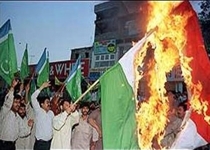 The incident, which took place in March 2003, explains turning of a heaven into hell and the height of tyranny to its people who had been refrained by India from exercising their right to self-determination. The situation has not changed in any way over the years. The strength of the armed force, around half a million across the occupied Kashmir in 1990, increased 50 per cent in 2009.